Negoro- no Komizucha (Negoro-no Komizucha) dressed as a warrior-monk fighting with a long nail-studded club (a tetsubo) and a broken naginata. 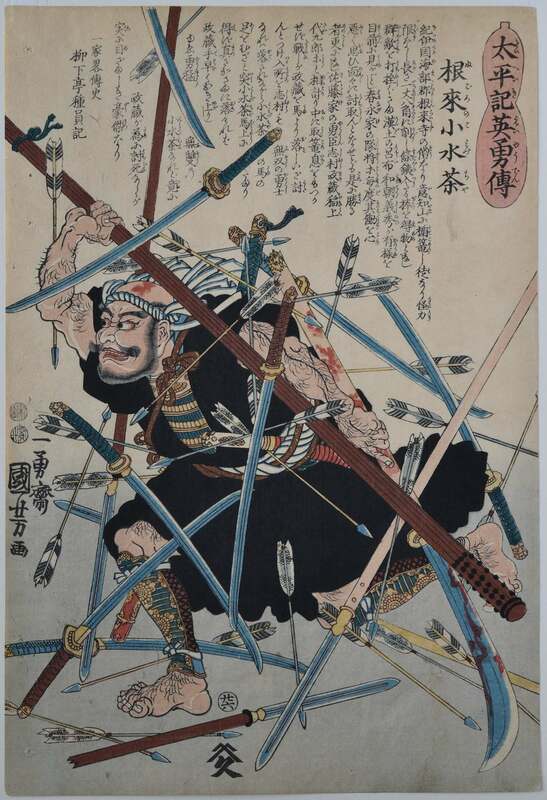 Swords and arrows fly about him.. From the set Taiheiki yeiyuden, “Heroic Stories of the Taiheiki. A history of the wars of the loyalist Nitta and Kusunoki families against the Ashikaga war-lords during the second quarter of the fourteenth century. But in fact the subject of this set of fifty prints (this design numbered 26) is the civil war of the late 16th century. Censorship restrictions imposed in the 1840s prevented publishers from illustrating historical subjects from the Tensho era 1573-92 onwards, so the publishers circumvented this by slightly altering the names of the historical figures. Published 1848-9 by Yamamoto-ya Heikichi. Robinson S62.26. One of the best designs from the set. Fine impression and colour. Very good condition. Signed Ichiyusai Kuniyoshi ga.